Farghadani was imprisoned in January 2015 for a political cartoon satirising members of the Iranian parliament. The artwork joins the twitter.com/hashtag/draw4atena #Draw4Atena social media initiative and was commissioned by the Journalism Is Not A Crime campaign for persecuted journalists in Iran. 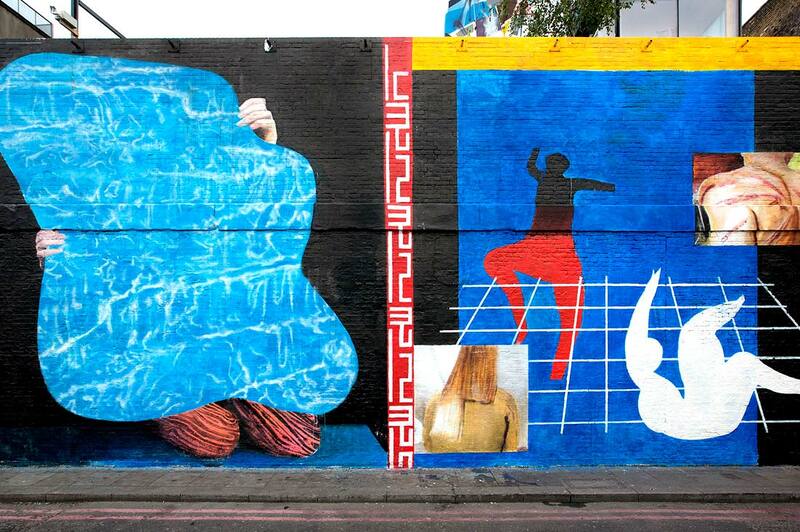 Zbiok explains his relationship with London, street art and the importance of creating work that conveys meaning. “London is a special place for me. I was painting in the street ten years ago, before the street art boom, so I see how it’s changing. It’s also very inspiring, especially this place – you’ve got gentrification and you’ve got the hipsters but art is still working. People here are genuinely interested in art. I have an arts school background. I used to do a lot of illustrations but a few years ago I decided it was really boring and it didn’t let me expand in an artistic way. Basically, for it to be interesting it has to be a little bit provocative for people, this way it makes their imaginations work. My problem with doing things that are ‘typical street art’ is that they are mostly illustrations. And okay they are nice, they are decorative but still it’s not something that I would call art. For me art is something more. Street art is often closely related to graffiti in terms of style. Often this means that the work has black line borders which you can’t go over. That’s why I stopped using these street art conventions and constrictions and right now I feel much more free as an artist. My visual style is mostly photo realistic images, that I mix with some bold graphics. I’m really interested in classic modern paintings so you can relate my work to those traditions – on one hand it’s the modernist illustration tradition including painters like Matisse or Léger. Then, on the other hand, I use photo realistic images, so basically it’s a mix of this and that. I’m relating the story of a girl called Atena, a cartoonist who was sentenced to jail for 12 years for drawing a cartoon which is something that is totally impossible in Western culture. That’s why we have to say it even louder because we cannot treat people like this. This wall is about two kind of emotions. One is art as a form of freedom – we’ve got the girl who is holding up a big mirror which reflects the water – or something that isn’t really a shape. It’s a metaphor for art or the freedom you can get from art. On the other side we’ve got the images that are full of violence which is a representation of the situation some people are in, in Iran. Here is the installation video which Journalism Is Not A Crime produced. More photos from on Flickr.